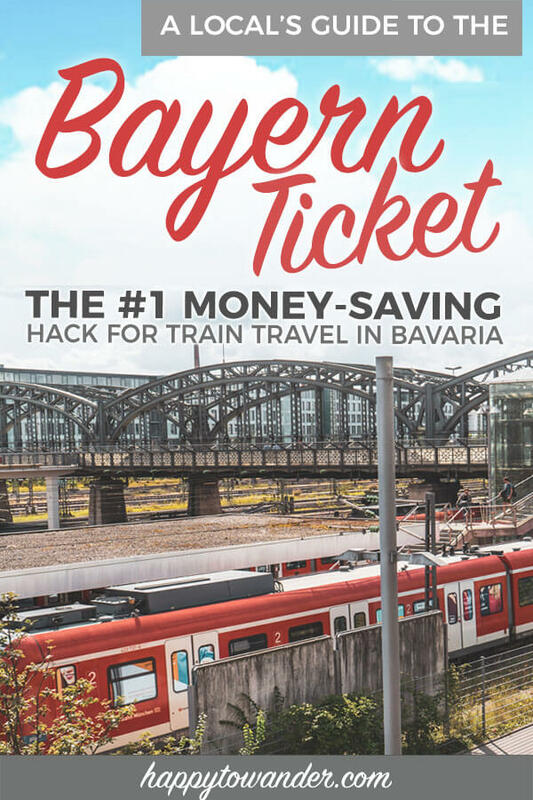 BayernTicket 2019 Guide: How to Use the Bayern Ticket Hack for Cheap Trains in Bavaria! The BayernTicket is hands down one of my favourite secret tricks when it comes to saving big on trains in the German state of Bavaria. What kind of savings am I talking? Genuinely, if you’re a full family or a big group, you can save over a hundred euros in a single day, and when you do the math, that is a LOT of beer and pretzel money. So I’m guessing I have your attention, right? Long story short, the Bayern ticket is a magical little ticket created by the German railway company Deutssche Bahn that grants you UNLIMITED travel in Bavaria on regional trains, buses, U-Bahns and more for a day, all for a cheap price that only gets lower the more friends you bring! The best part is, this is an easy deal to take advantage of. The main problem is a lot of first time visitors don’t realize it exists, which is why I’ve written up this straightforward guide to understanding how the Bayern Ticket works and all the little fine print/nuances you should be aware of when using it. As someone who has purchased dozens of Bayern Tickets over the years, trust me when I say I’ve learned a trick or two. So, without further ado, here’s a simple guide to using the DB Bayern Ticket! What is the DB Bayern Ticket (Bavaria Ticket)? 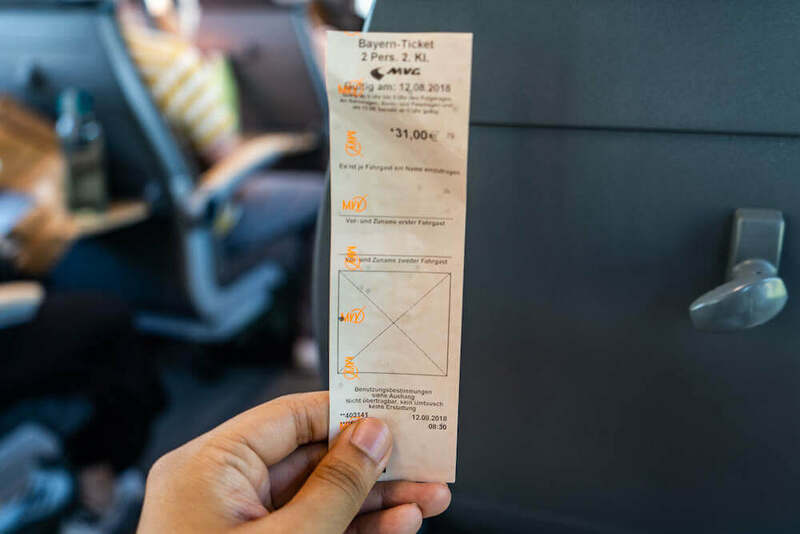 Long story short, the Bayern Ticket (or Bavaria Ticket in English) is a special regional train ticket for the German state of Bavaria. It allows you UNLIMITED travel for a day on regional buses and trains. The best part? 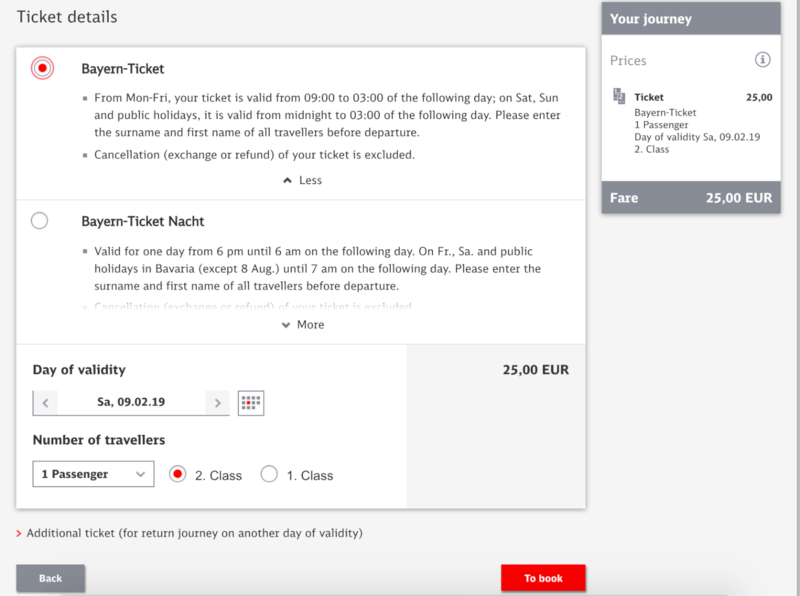 The BayernTicket is priced in such a way that the first passenger pays 25 euros, then you only add 7 euros for every additional passenger (up to 5 adults total). So, imagine you want to visit Neuschwanstein Castle for the day with your 3 friends. Instead of buying individual tickets to Füssen (23 euros each way per person) then getting tickets for the local bus from Füssen to the castle, you can instead just pay 46 euros for all four of you (25 euros for the 1st person, 7 euros for each additional). 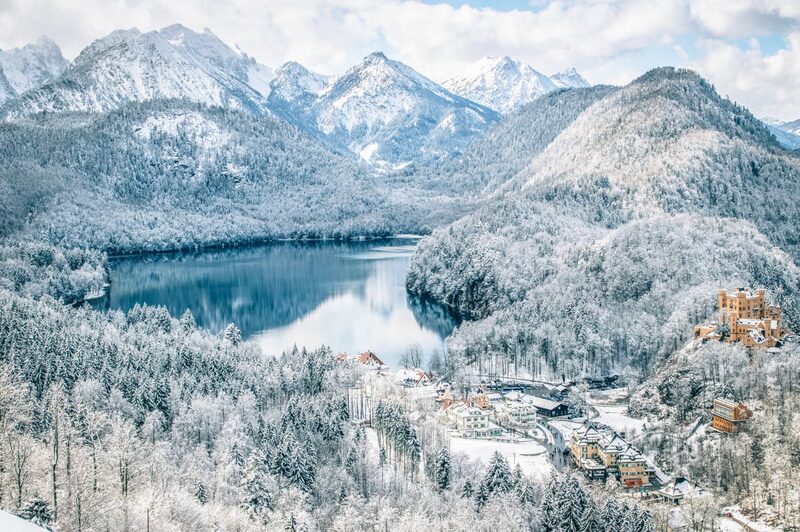 This covers UNLIMITED public transport in Bavaria for the day, including your commute to the Munich train station, the train ride to Füssen and the bus ride to the castle. All of it! For 46 euros! Do you see why I’m so obsessed with this ticket now? Think of how much money you could save. The great thing is you can use the Bayern Ticket to go to pretty much any touristy place in Bavaria, including the many gorgeous lakes surrounding Munich, the stunning Partnachklamm, and even Salzburg, which, while in Austria, is a route still valid with a Bayern Ticket. So, eager to learn more? The Bayern Ticket is a simple deal in theory, but in practice there are a lot of random little intricacies that stump and confuse tourists, so I’ll clarify below. There are two types of Bayern Ticket: the regular Bayern Ticket and the Bayern Ticket Nacht (Night). As you can see, the Bayern Ticket Nacht is a little cheaper than the regular Bayern Ticket. 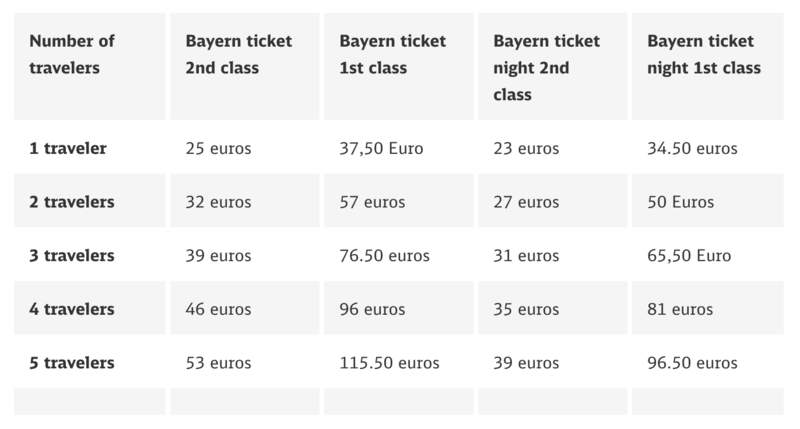 For both the Bayern Ticket and Bayern Ticket Nacht though, you can choose between first and second class. In my honest opinion, the difference between classes in regional trains is minimal and not worth the cost difference. The main perk of 1st class is it’ll be less crowded and therefore easier for you to find a seat. Where can I buy a Bayern Ticket? 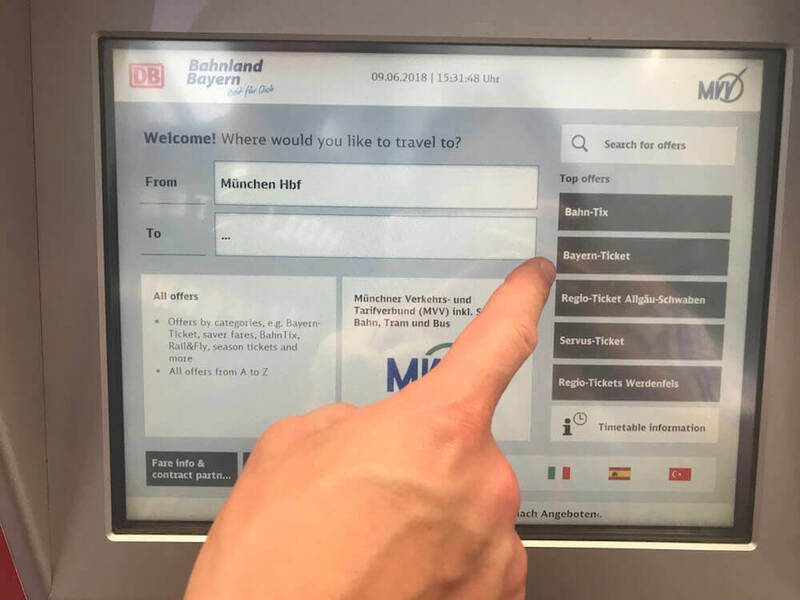 You can buy Bayern Tickets online, at any DB Ticket Machine and usually at any ticket machine you find in train/tram stations (including U-Bahn, S-Bahn, etc.) There’s also the option to buy them from a ticket person at a train station, but they charge 2 extra euros for this service, so you’re better off just buying it from a machine. If you want a step by step tutorial, I break down the process below. 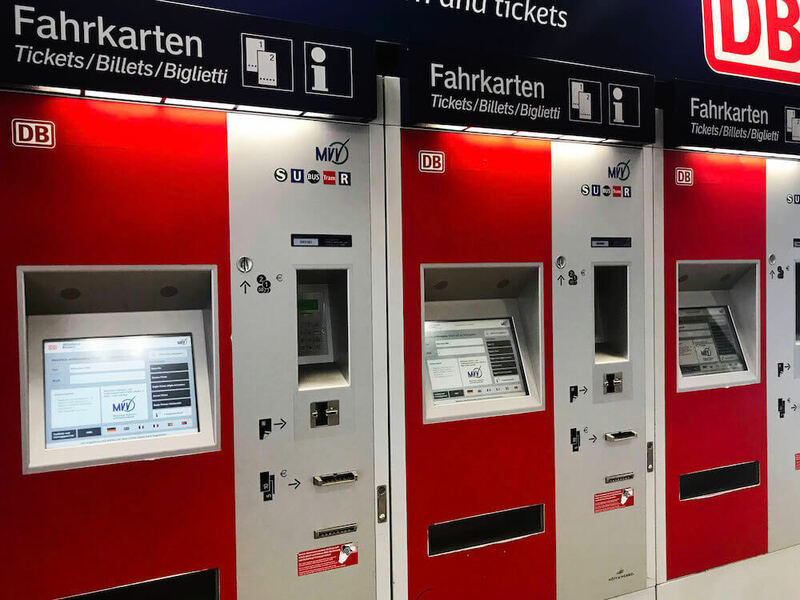 There are a few different ways to buy a Bayern Ticket, either from an in-person DB Ticket Machine or online. You can also get one from the special ticket salespeople in train stations but they charge 2 euro additional for this apparently, so I’m not including it here. 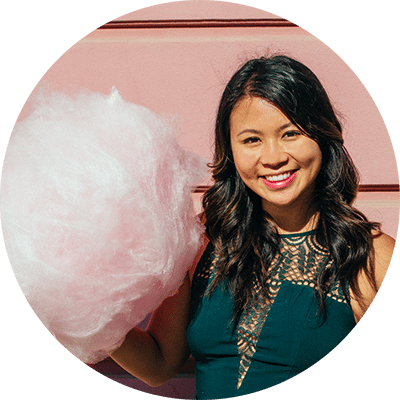 You can easily buy the ticket yourself without help from a random DB employee, so here’s how you do it – step by step. STEP TWO: To activate the English menu, click on the British flag. STEP THREE: Look for a part of the touch screen that says “DB Special Offers” or “Top Offers”. 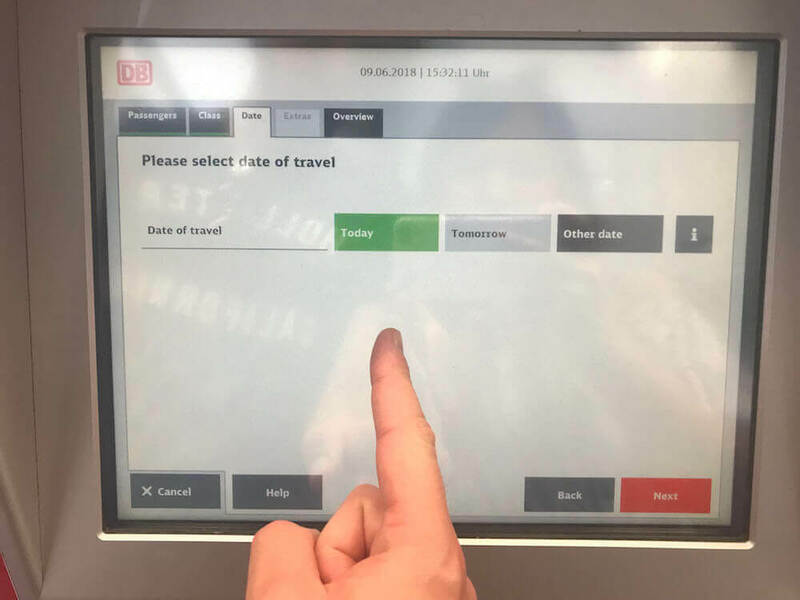 On the DB ticket machines at the Munich Central Station, they have it conveniently located on the right side of the main screen for convenience, but on other machines it’s sometimes nested under a “DB Special Offers” button. Either way, find it and press “Bayern Ticket”. STEP FOUR: Select the number of passengers. If you are travelling with any dogs or children, make sure you check the rules to see if you need to pay for them as a regular passenger. If your dog is small (they say the size of a house cat or smaller) then you can bring your dog on for free. If they are larger, you must pay for a spot for them and write “Hund” (German for dog) on the ticket where all the passenger names go. STEP FIVE: Select your class. As you can expect, first class costs much more, and honestly, there isn’t a huge difference between first and second class on these regional trains. The main perk is that first class will be much quieter and you won’t have any trouble finding a seat for yourself, but this isn’t usually a huge issue in 2nd class provided that you get there early enough. 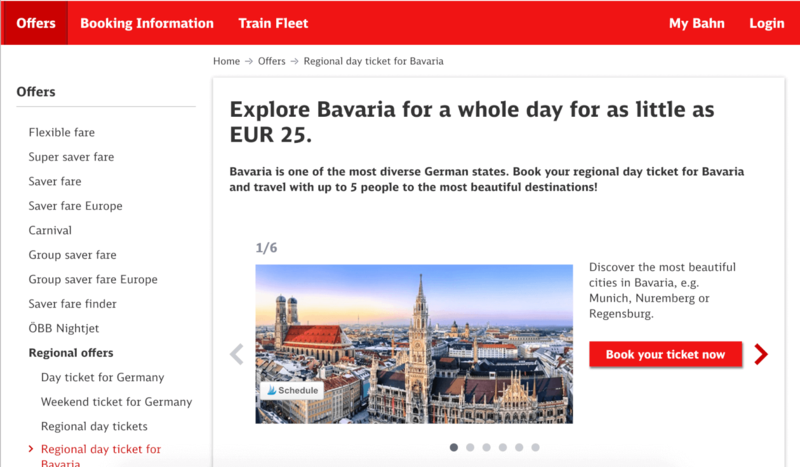 STEP SIX: Select the date of your travel, either today, tomorrow or a separate date, although keep in mind there really isn’t much benefit to purchasing a Bayern Ticket far in advance because the price doesn’t change. STEP SEVEN: Choose whether or not to collect Bahn points. If you don’t know what these are, then you don’t need them. You can press “do not collect”. STEP EIGHT: Look all the details over to ensure that everything is correct. Bayern Tickets aren’t amendable or refundable unless under very special circumstances so make sure everything is correct before you pay. You’ll also see the terms and conditions on the right side when you’re about to pay. STEP 9: Pay and the Bayern Ticket will be printed! Time to happy dance. Don’t forget to write all passenger’s names on the ticket ASAP. STEP ONE: Head over to the English version of the DB website for Bayern Tickets here. Click the red Book Your Ticket Now button. STEP TWO: Select whether you want a Bayern-Ticket or a Bayern-Ticket Nacht. Then scroll down and enter all the important details like the date of validity, number of passengers and class. 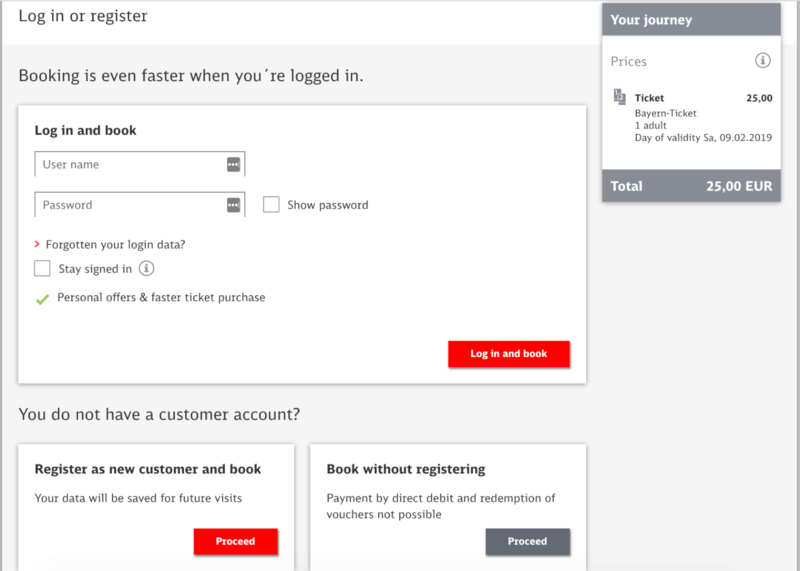 Click the red To Book button when you’ve entered everything. STEP THREE: At this point they’ll ask you to log in, but you can easily check out as a guest if you don’t want to make an account. Just scroll to the bottom where it says Book without Registering and press the grey Proceed button. STEP FOUR: Select how you want to get your ticket. Most likely, it’ll be more convenient to just get a Digital Ticket. Select that and then move onto payment. Once you’ve paid, you’ll receive your confirmation, and your digital ticket which you can load onto your DB app! Where is the Bayern Ticket Valid? Generally speaking, as a tourist, you don’t need to worry too much about the intricacies of the Bayern ticket. If your destination is within Bavaria, and you’re taking a regional train (not ICE), you’re fine. All the most touristy spots in Bavaria like Neuschwanstein Castle, Munich, etc. have frequent connections that you can use with the Bayern Ticket. 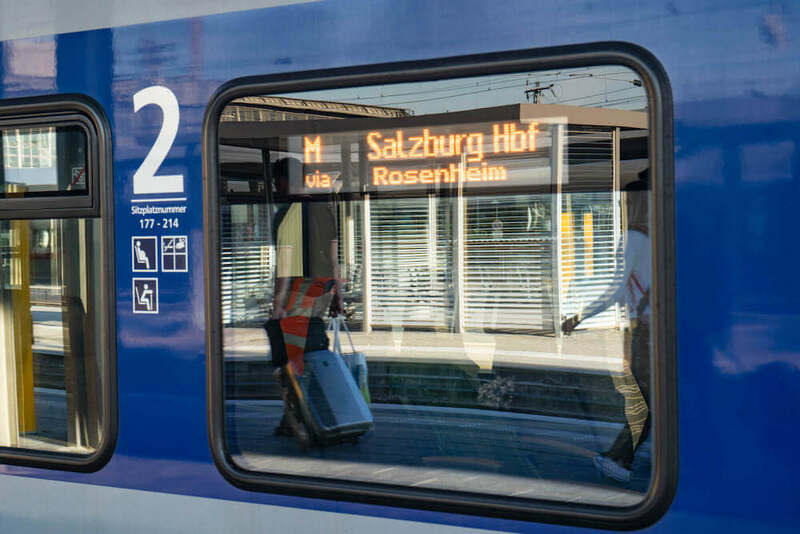 Select routes like Salzburg are also covered. Worst comes to worst, just ask a DB employee before boarding and you’ll be fine. That said, if you want some clarity, here are the official rules regarding Bayern Ticket validity. I love using the DB App because it’s free and it’s the most accurate and up-to-date way to check timetables, buy tickets, etc. One trick I really love is using it to find out which trains are regional (and therefore included in the Bayern Ticket). Here’s how you do that. One of the most common question about Bayern Ticket validity is whether or not you can use the Bayern Ticket to visit Salzburg, Austria. The answer is yes, yes you can! 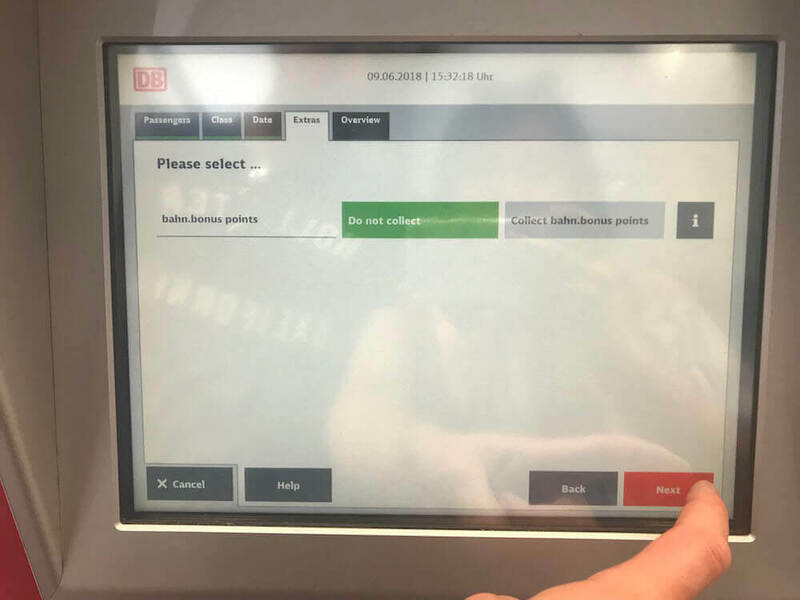 The Bayern Ticket covers the Meridian Train that takes you from Munich to Salzburg and is one of the few exceptions where you can use the Bayern Ticket outside of Bavaria. NOTE: Just don’t forget your passport – checks at the border are rare but not unheard of. I’ve experienced them twice on the train. For more info on doing a Munich to Salzburg day trip, click here for my full guide. How can I tell if a BayernTicket is a good option for me? 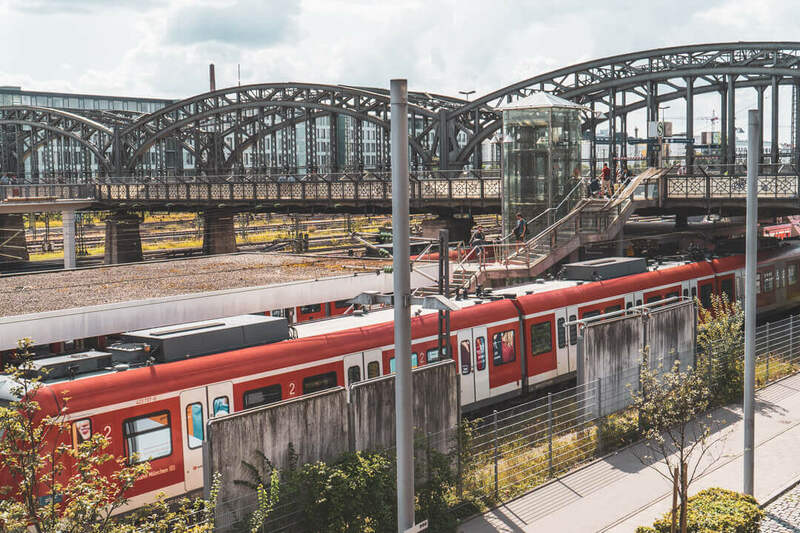 From experience, the BayernTicket is almost always the best deal available if you intend to do more than one trip in a day. If you want to double check the math though, just do a quick search for your trip and see how much a full-priced ticket would be (bearing in mind the Bayern Ticket would also cover public transport like buses, U-Bahns, etc.) If that amount comes out to more than what your Bayern Ticket would cost, then you’ve found yourself a great Bayern Ticket deal! 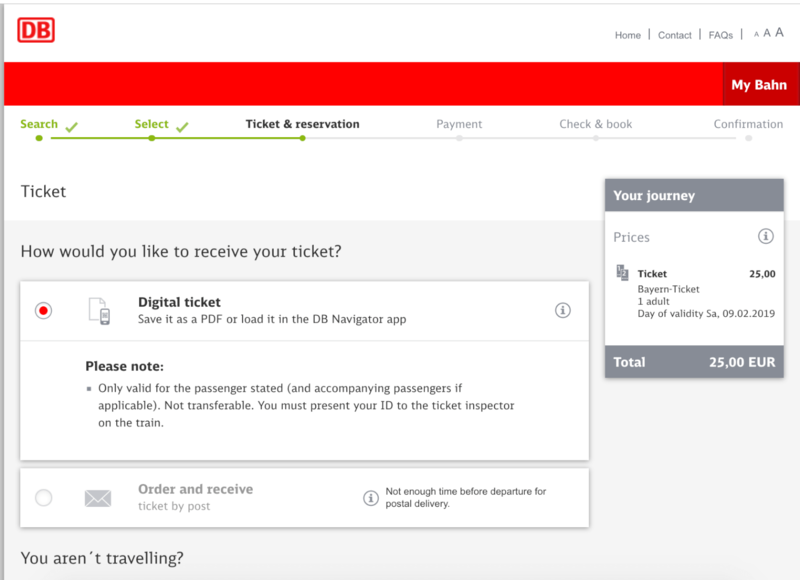 How can I tell if the BayernTicket is valid for my trip? I explained the validity of Bayern tickets in detail above, but basically if you’re travelling within Bavaria (e.g. 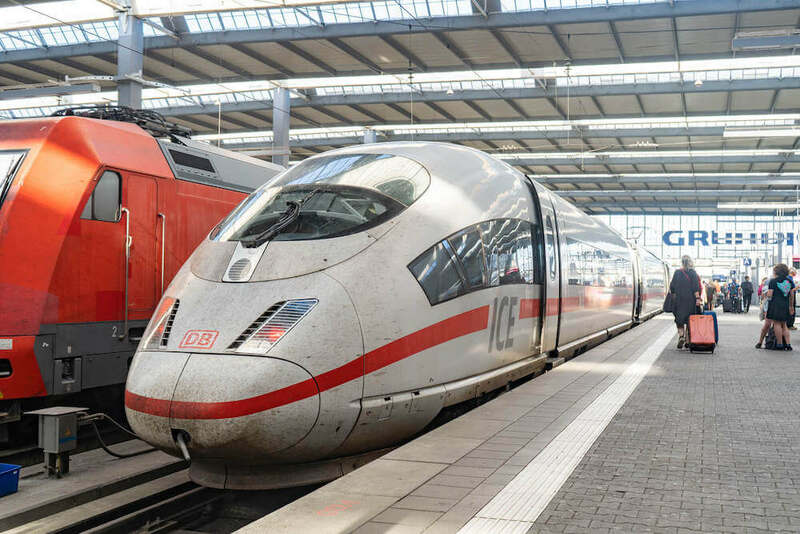 your departure point and destination are in Bavaria) and you’re using regional trains and public transport the entire time, there are very few instances where the BayernTicket wouldn’t cover you the entire way. Worst comes to worst, just ask a DB employee before you board. What are the validity times for the Bayern Ticket? Can I also use the BayernTicket on buses? The Bayern Ticket covers you on most buses, but there are some exceptions. If you want to double check, click here for a list of buses not covered by the Bayern Ticket. What about kids? Can I bring children with me on the BayernTicket? For 1-2 person Bayern Tickets, adult passengers can bring as many of their own children or grandchildren as they want, so long as they are under the age of 15. Can I bring a dog with the BayernTicket? If your dog is small (they say the size of a housecat or smaller) then you can bring your dog on for free. If they are larger, you must pay for a spot for them and write “Hund” (German for dog) on the ticket. Can I bring my bike with the BayernTicket? If you have a foldable bike that fits into the regular luggage racks, then you can bring it on for free. Otherwise, you need to pay for a bicycle day ticket, which is 5.50 euros per person per bike per day. I mentioned this earlier, but if you buy at a DB ticket desk in a train station (i.e. if a human is helping you book the ticket), they charge a 2 euro surcharge. Since it’s so simple to just get your own ticket through the machines, I’d advise you just do it yourself. 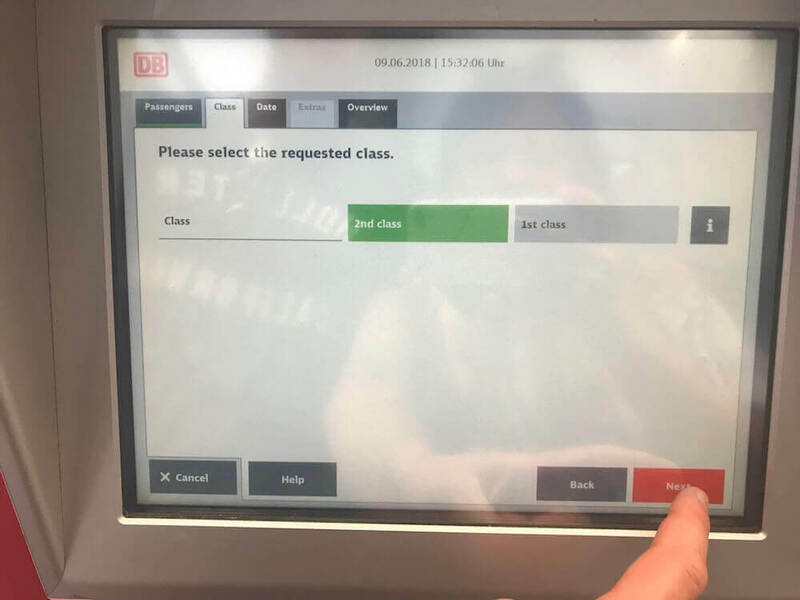 The DB Ticket Controllers can be pretty ruthless when it comes to kicking people off the train for riding with a Bayern Ticket that’s not yet valid, even if it’s only a few minutes before validity kicks in. One time some friends of mine were going on a hike and they got their ticket checked at 8:55am. They were kicked off at the next station because the ticket isn’t officially valid until 9am. One of the main conditions of the BayernTicket is that you need to write down the names of each passenger riding on it. This is kind of a tough thing to do when you don’t have a pen. Make sure you bring a pen with you so you can write down all the names before your ticket gets checked. 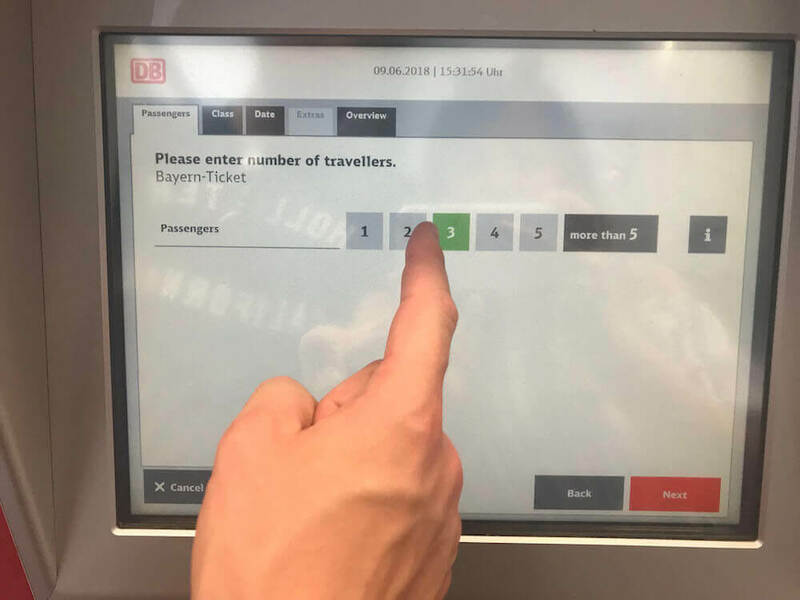 Usually they are quite patient with you and will let you borrow a pen, but you never know with these DB ticket controllers – sometimes they’re ridiculously grumpy. While most of the time they don’t ID you, sometimes they do check ID for Bayern tickets because they want to make sure everyone who claims to be on the ticket is actually written on the ticket, if you know what I mean. I have also been IDed 100% of the time when buying a Bayern Ticket online. While sometimes you can get away with showing any kind of ID, like a driver’s license, I’ve been in situations where they insisted on a passport. This is because a lot of German officials weirdly don’t see driver’s licenses as a valid form of ID. It’s confusing, I know, but these days I always just bring my passport with me just in case they ask. I’m not gonna lie, the difference between 1st and 2nd class on regional German trains is pretty negligible, so I wouldn’t blame you if you accidentally waltzed into 1st class with a 2nd class ticket. This is a really easy mistake to make, so just double check you’re sitting in the right class. There will be a big number on the outside of the train, but on the inside too you’ll see little blue squares with either a “1” or a “2” inside. This sounds like common sense, but as a frequent user of the BayernTicket during my belligerent student days, I know that on more than one occasion, people split up on group trips and kinda waltz off to do their own thing, forgetting that literally one person in the whole group has the train ticket. Obviously, during ticket control, it’s important that you’re sitting together or at least very close. One time my whole group did a trip to Chiemsee, only to realize the guy holding the Bayern Ticket had gone to the bathroom and missed the bus, and the OTHER guy with the Bayern ticket had voluntarily stayed behind to be a good friend. This meant 8 of us rode without a ticket on the bus all the way to Chiemsee without realizing… Students, man. We are not smart. Landscape around Neuschwanstein – accessible by Bayern Ticket! Any more questions about the Bayern Ticket? I hope you found this guide helpful! Have an amazing time frolicking around Bavaria, and let me know if you have any more questions. Thanks for the great details! May I know after I bought the Bayern’s pass and let say I’m going to Fussen by train now, do I required a separate ticket? Which app to use to check train timing, departure platform etc? No need for a separate ticket, just show the inspectors your Bayern Ticket! And you can use the DB App for that 🙂 It’s free! Hi Eric, are you 100% sure you purchased a Bayern Ticket and not a regular ticket? 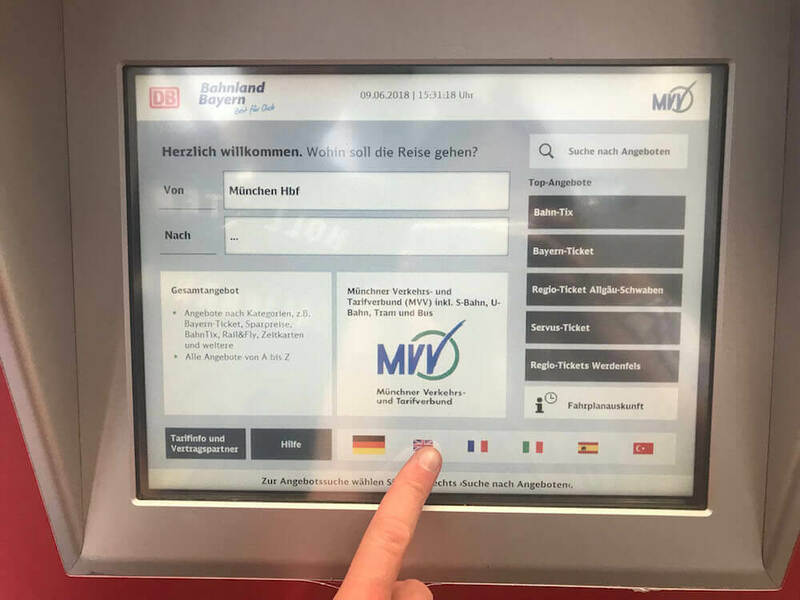 Usually Bayern tickets won’t indicate a destination or set time – they’ll just have the date, number of people and slots for you to write down their name. 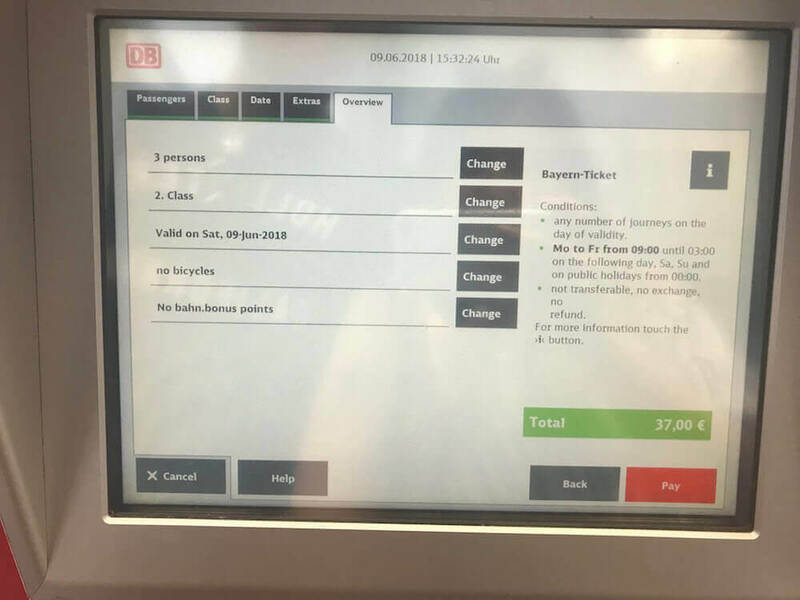 If you HAVE purchased a Bayern ticket, then yes you can use it to ride the train as many times as you want that day during the period of validity (see details in the post above) and you could even use it to go to Salzburg provided that it’s still valid when you depart. I would double check that you haven’t purchased a regular ticket rather than a Bayern ticket though because as I mentioned, Bayern tickets usually wouldn’t have a destination on them!